Most of Parque Natural Cabo de Gata-Níjar is a montane coastal strip on the southernmost tip of the province of Almería, Andalucía, Spain. Its three sections extend from Cabo de Gata to Carboneras, Almanzora north east of Carboneras and the mountains behind Níjar. The focus of this website is the coastal strip from Cabo de Gata to Carboneras. Designated an international Geopark it now has a geology and mining museum at Rodalquilar. 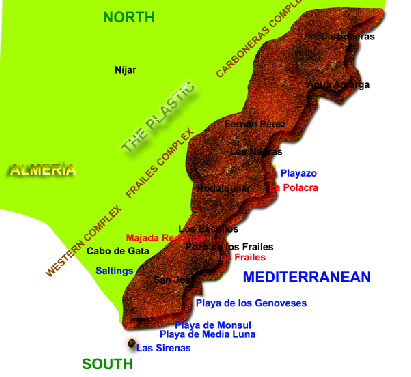 The sketch map shows key places mentioned in the website; Almería is to the west and the textured area represents the coastal volcanic mountains. Between Cabo de Gata and these mountains on the western edge is an old saltings, also part of the Natural Park. ‘The Plastic’ is the sardonic name given by people to a large alluvial plain, El Hornillo and Campohermoso (‘Beautiful pastures’ - a serious misnomer now), filled to overflowing with Dutch polythene, leaving little uncovered ground, neither pretty nor ecologically sane but a powerful economic boost (perhaps even a bubble?) in a previously economically deprived area.